As a white pigment, titanium oxide is used for cosmetic application. This oxide is well known to have the photo catalytic activity. Therefore, a certain degree of sebum on the skin is decomposed by the ultraviolet radiation in sunlight. 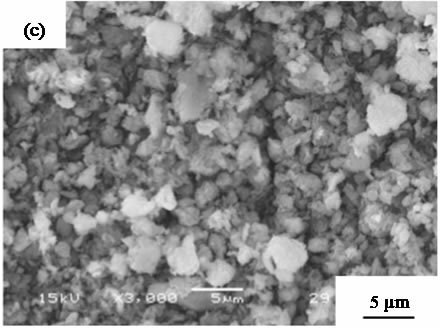 In this work, titanium phosphates were prepared with titanium chloride and sodium triphosphate in hydrothermal process as a novel white pigment. Their chemical composition, powder properties, photo catalytic activity, color phase, and smoothness were studied. The obtained phosphates had little photo catalytic activity. The particle size of phosphate pigments consisted of a normal distribution at 2 µm by the hydrothermal treatment for 4 and 8 hours. The slipping resistance of samples became small by the hydrothermal treatment. As a white pigment, titanium dioxide is used for cosmetic application . This oxide is well known to have the photo catalytic activity. Therefore, a certain degree of sebum on the skin is decomposed by the ultraviolet radiation in sunlight. To repress this effect, some kinds of the technical process are investigated and used. For example, as one of these techniques, the composite particles with silicon oxide are used . However, these particles are hard materials for human face. The mild materials for human face are required as a white pigment. In addition, there was a report that microfine titanium dioxide would be adsorbed through the skin . The novel white pigment that is not adsorbed is required. As a pigment for cosmetics, the particle shape and size distribution are important. Sphere homogenized particle are expected to spread well on the skin. However, too much small particles are not suitable because pigments got into the pores in the skin. The hydrothermal process is generally used to control the powder properties of inorganic phosphate materials [9-11]. The time of the hydrothermal treatment had important factor such as temperature, reactant concentration, and pH values. 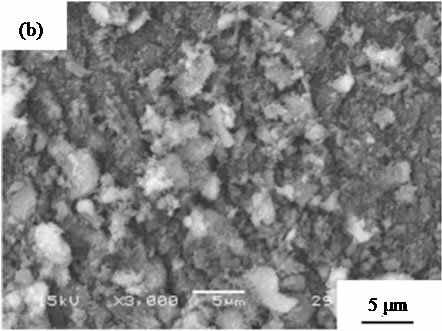 In previous work , we prepared the titanium phosphate pigment that had no catalytic activity. However, the obtained particles had the wide distribution from 1 µm to 300 µm in size. Therefore, the purpose in this work is to obtain the homogenized titanium phosphate particles. Phosphates are transformed to other forms of phosphates by hydrolysis and dehydration reactions at elevated temperatures. These condensed phosphates have the possibility to have novel functional properties. Orthophosphate has been mainly investigated for many applications, on the other hand, condensed phosphates have been little studied. 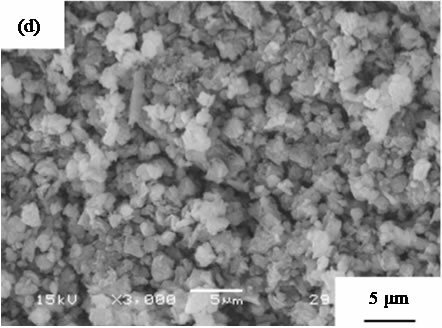 In this work, titanium phosphates were prepared from titanium chloride and sodium triphosphate solution in hydrothermal process for several hours. Their chemical composition, powder properties, photo catalytic activity, color phases, and smoothness of the obtained precipitates and their thermal products were studied for the cosmetic application. Sodium triphosphate, Na5P3O10, was synthesized by heating the mixture of disodium hydrogen phosphateNa2HPO4, and sodium dihydrogen phosphate, NaH2PO4, at 400˚C for 5 hours. 0.1 mol/l of titanium chloride solution was mixed with 0.1 mol/l of the sodium triphosphate solution in a molar ratio of Ti/P = 5/12. This ratio of Ti/P was determined from the theoretical chemical composition of Ti5(P3O10)4. The mixed solution was set in the autoclave for 0, 2, 4, 6, 8, and 12 hours at 120˚C and 100 kPa (hydrothermal treatment). Then, the precipitates were filtered off, washed with water, and dried. The chemical composition of these materials was analyzed by XRD. XRD patterns were recorded on a Rigaku Denki RINT 2000 X-Ray diffractometer using monochromated CuKα radiation. TG and DTA curves of precipitates were measured with a Shimadzu DTG-60H at a heating rate of 10 K minute–1 in air. Samples were heated at 100˚C, 200˚C, 400˚C, 600˚C in air conditions. These thermal products were also analyzed by XRD patterns. The powder properties of the precipitates and their thermal products were estimated from SEM images and particle size distributions. Scanning electron microscopy (SEM) images of titanium phosphates were observed using JGM-5510LV, JEOL Ltd. The particle size distributions of these materials were measured with laser diffraction/scattering particle size distribution HORIBA LA-910. The cosmetic properties were estimated by the photo catalytic activity, the color phase, and the smoothness. The photo catalytic activity of samples was estimated with the decomposition of methylene blue by 365 nm radiation [13,14]. The color of phosphate pigments was estimated by ultraviolet-visible (UV-Vis) reflectance spectra with a Shimadzu UV2550. The smoothness of particles was measured on an artificial leather with KESSE objective evaluation of surface friction property, KATO Tech Co. Ltd. Figure 1. XRD patterns of samples prepared in hydrothermal treatment for various hours, (a) 0, (b) 2, (c) 4, (d) 8, and (e) 12 hours, △; TiP3O9. example Ti2O(PO3)6. The peak intensity became weak by the hydrothermal treatment. All samples had a certain degree of amorphous phase. 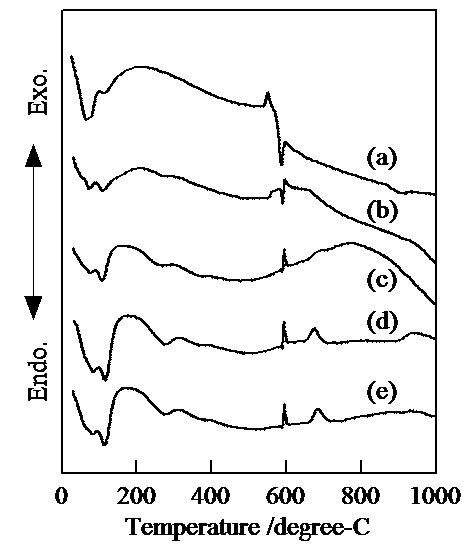 By heating at 600˚C, the peaks of TiO2 appeared in XRD patterns. Figure 2 shows TG curves of samples prepared in hydrothermal process for several hours. 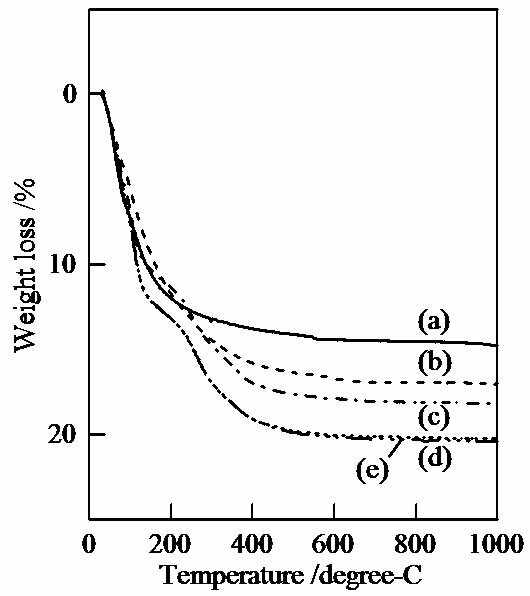 The weight losses at 600˚C were 14.4%, 16.7%, 17.9%, 20.1%, and 20.2% in TG curves of samples prepared for 0, 2, 4, 8, and 12 hours, respectively. With the increase of hydrothermal hours, these weight losses below 600˚C became larger. Especially, samples prepared for 8 and 12 hours had the step at 230˚C in TG curve. By the hydrothermal treatment, titanium phosphates became easy to contain water, hydroxide anion, and so on. Figure 3 shows DTA curves of samples prepared in hydrothermal process for several hours. The endothermic peaks at 70˚C and 110˚C were observed in DTA curves of all samples. These peaks were due to the volatilization of adsorbed and crystalline water. Sample prepared without the hydrothermal treatment had an exothermic peak at 550˚C and an endothermic peak at 590˚C in DTA curve. These peaks were considered from the transition of chemical phases. By the hydrothermal treatment, the transition took place in the exothermic reactions at 590˚C and 680˚C. A small endothermic peak at 270˚C appeared in DTA curves in samples prepared with the hydrothermal treatment. This peak was due to the volatilization of water from the condensation of hydroxide anions. Figure 2. TG curves of samples prepared in hydrothermal treatment for various hours, (a) 0, (b) 2, (c) 4, (d) 8, and (e) 12 hours. Figure 3. DTA curves of samples prepared in hydrothermal treatment for various hours, (a) 0, (b) 2, (c) 4, (d) 8, and (e) 12 hours. are suitable for the cosmetic applications. 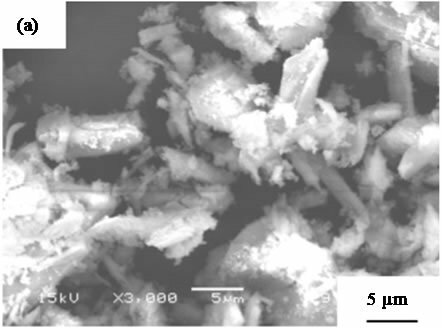 Figure 4 shows SEM images of samples prepared in hydrothermal process for several hours. All samples had no specified shape in spite of the hydrothermal time. The particle size in SEM images became smaller with the hydrothermal hours. Figure 4. SEM images of samples prepared in hydrothermal treatment for various hours, (a) 0, (b) 2, (c) 4, (d) 8, and (e) 12 hours. Figure 5. 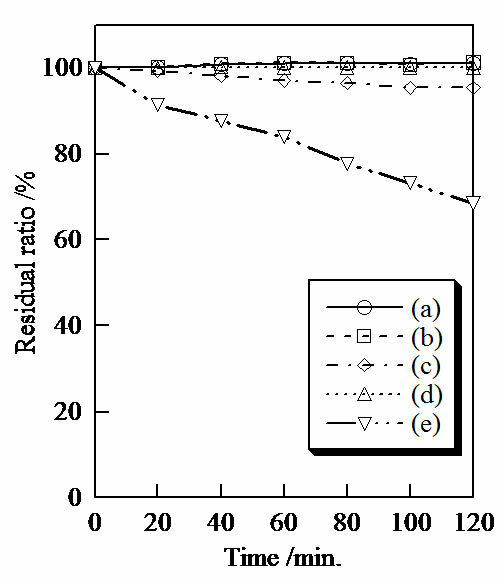 Particle size distribution of samples prepared in hydrothermal treatment for various hours, (a) 0, (b) 2, (c) 4, (d) 8, and (e) 12 hours. for 2 hours consisted of two normal distributions at 3 and 30 µm (Figure 5(b)). On the other hand, samples treated for 4 and 8 hours had a normal distribution at 2 µm (Figures 5(c) and (d)). 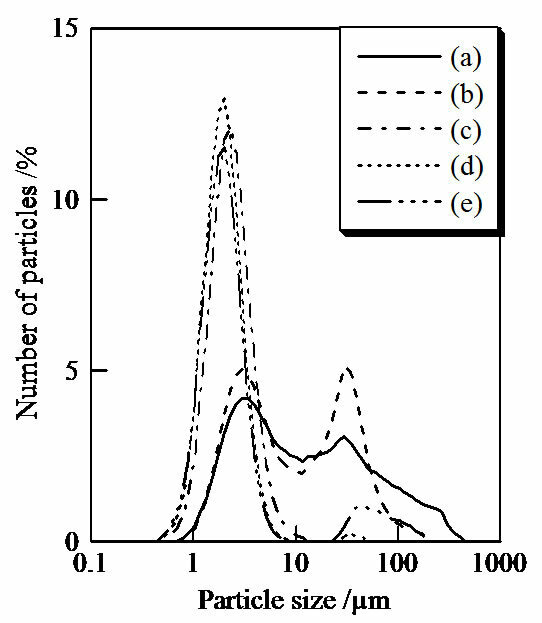 The large particles at 40 µm appeared in particle size distribution of sample treated for 12 hours (Figure 5(e)). By heating, the particle size became larger than 10 µm (not shown). For cosmetic application, small and homogenized particles are suitable. However, too much smaller particles had trouble to get into the pores in the skin . The standard size of the white pigment for cosmetics is difficult to determine, because the size of pore in the skin is determined from age, gender, climate, and so on. Further, too much larger particles are also inappropriate because of the cracking of coating on the skin. It is important to control the particle size of pigments. The hydrothermal treatment has the possibility to control the particle size of titanium phosphate pigments for the cosmetics. Figure 6. 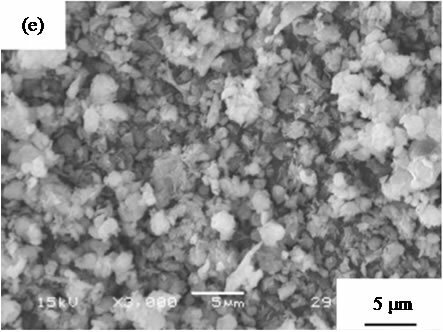 Photo catalytic activity of samples prepared in hydrothermal treatment for various hours and then heated, (a) blank, (b) 0 hour, R.T., (c) 8 hours, R.T., (d) 8 hours, 400˚C, and (e) TiO2. activity in spite of the hydrothermal time and heating temperature (Figures 6(b)-(d)). Titanium phosphate was mild material to protect the sebum on the skin. Figure 7 shows UV-Vis reflectance spectra of samples prepared in hydrothermal treatment for various hours. All samples and titanium oxide indicated high reflectance at the range of visible light. 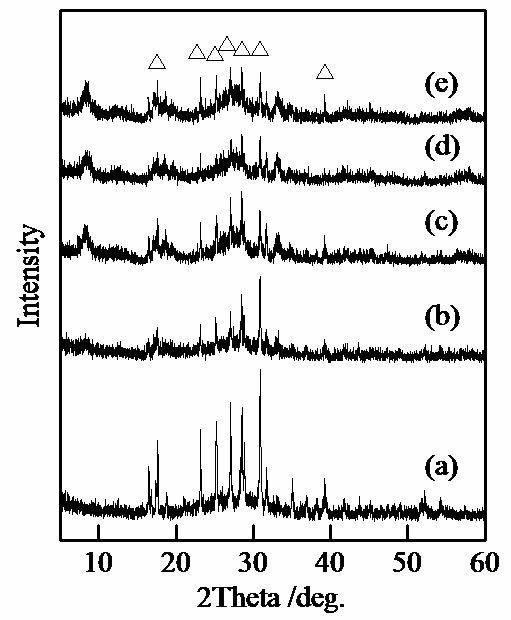 Titanium oxide adsorbed the ultraviolet light that was shorter than 400 nm in wavelength. On the other hand, samples prepared in the hydrothermal treatment for 4, 8, and 12 hours absorbed the light shorter than 360 nm in wavelength. As mentioned above, the pigment with high smoothness spreads well on the skin. The smoothness of the powders is also important in cosmetics . Table 1 shows the smoothness of samples prepared in hydrothermal process for several hours. The values of MIU and MMD represented the slipping resistance and roughness of powders, respectively. Sample powders spread on the article leather, and then a sensor ran on these powders. The values of MIU and MMD were calculated from the power to move a sensor and the pitching of a sensor, respectively. The value of MIU became small with the hydrothermal treatment. Samples had less change in the value of MMD by the hydrothermal treatment. Table 2 shows the smoothness of samples heated at several temperatures. By heating, the value of MIU became larger, because the heated samples had large and dispersed particles in size. The value of MMD was less affected from the heating temperatures. As a pigment for cosmetics, the heated phosphates were less suitable than sample without heating. Figure 7. 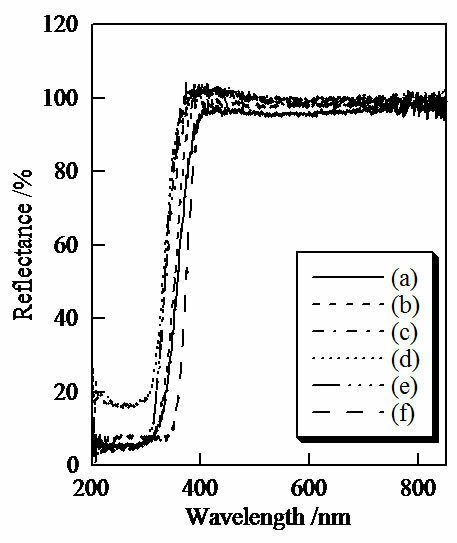 UV-Vis reflectance spectra of samples prepared in hydrothermal treatment for various hours, (a) 0, (b) 2, (c) 4, (d) 8, (e) 12 hours, and (f) TiO2. Table 1. Smoothness of samples prepared for various hydrothermal hours. Table 2. Smoothness of samples (hydrothermal time; 8 hours) heated at several temperatures. Titanium phosphates were obtained from titanium chloride and sodium triphosphate solution. The obtained materials had a certain degree of amorphous phase. These titanium phosphates had less photo catalytic activity to protect the sebum on the skin. The particle size of phosphate pigments consisted of a normal distribution at 2 µm by the hydrothermal treatment for 4 and 8 hours. The slipping resistance of sample powders became small by the hydrothermal treatment. The authors gratefully thank Dr. Takeshi Toyama, Nihon University, Japan, for the measurements of the smoothness.